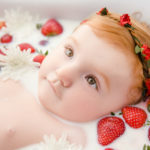 Milk Bath Photo Session - Los Angeles based photo studio, The Pod Photography, specializing in maternity, newborn, baby, first birthday cake smash and family pictures. 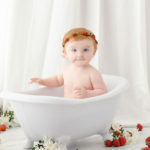 It’s all the rage lately – the milk bath photo session! 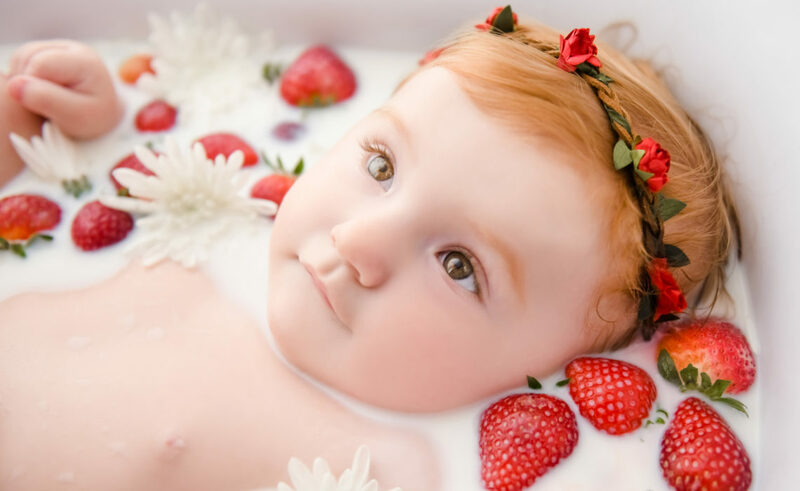 Whether you’re a mom, momma-to-be, a young kid or a little baby, these milk baths are absolutely stunning! 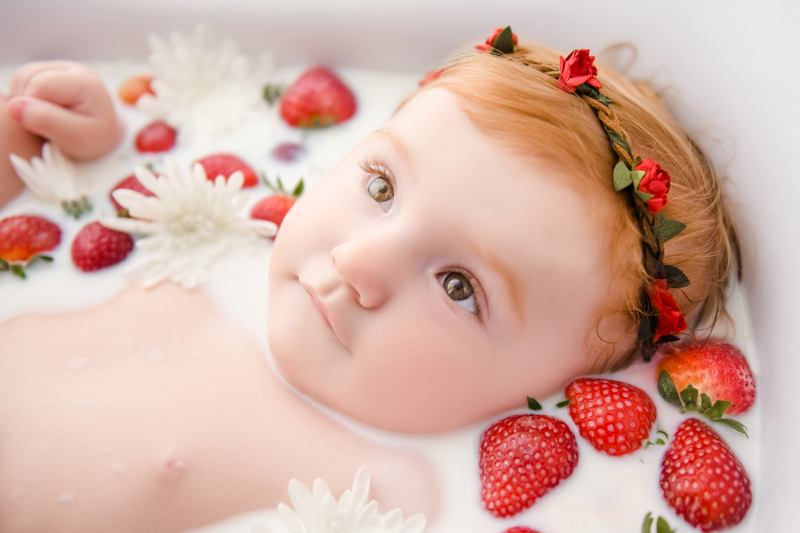 The traditional way to photograph these sessions is with a milk bomb and flowers. But as we’ve been doing more and more of them, we’ve played and experimented with other elements! 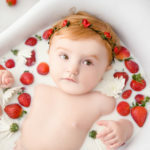 For this Los Angeles milk bath photo session, we incorporated this little girl’s first birthday party theme – Strawberry Shortcake! 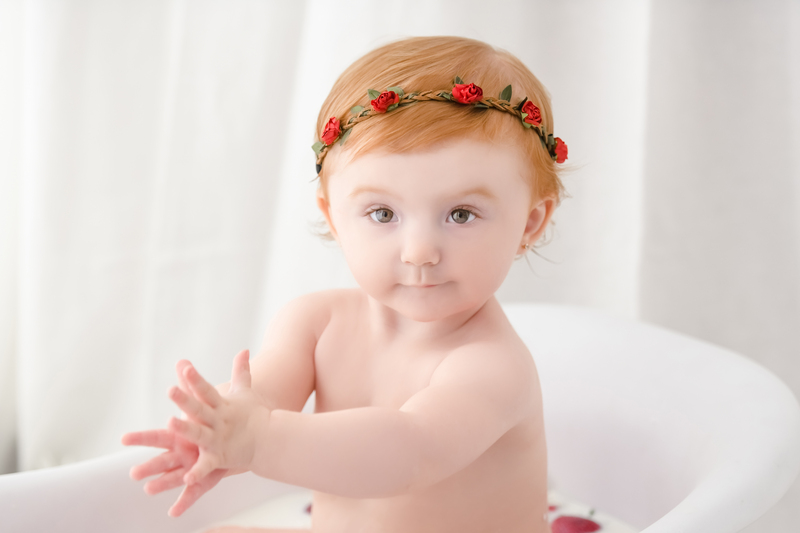 To celebrate her gorgeous red hair and fair skin, a soft background and soft lighting was perfect. 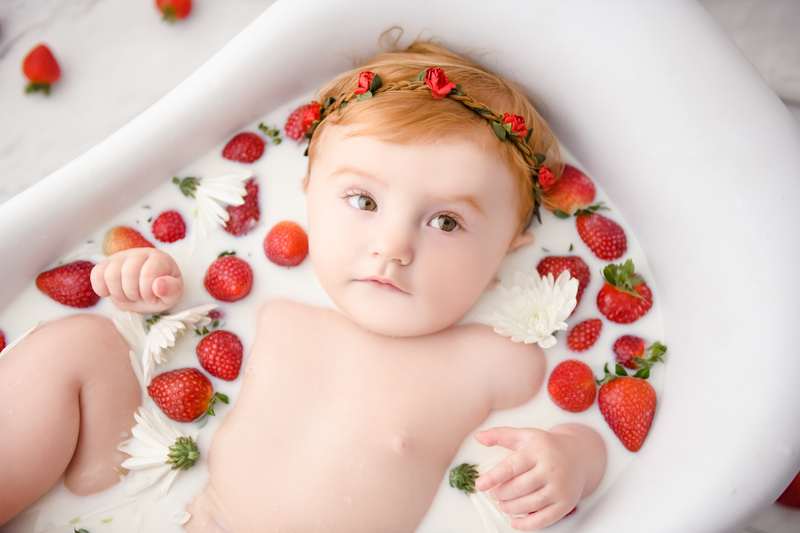 The red strawberries were so vibrant against the creamy water – her portraits looked like a painting! And she was a little rockstar, too! 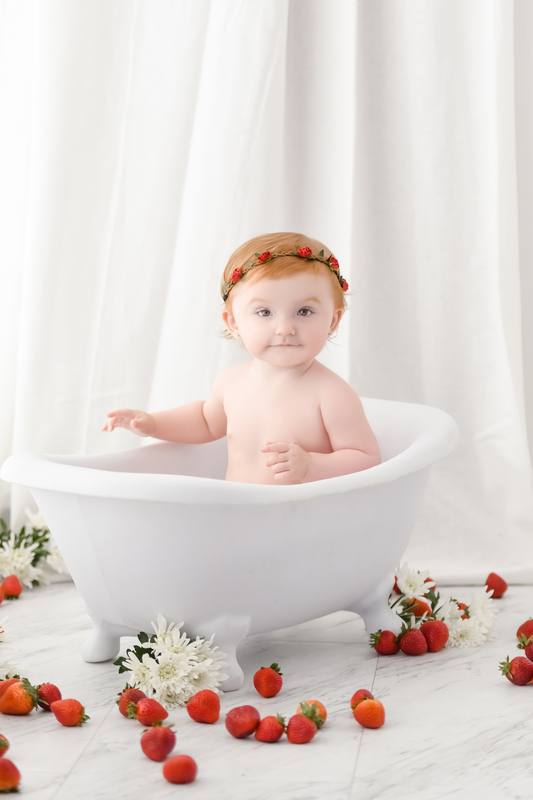 Typically, with babies over 7-9 months old, it’s more likely to get sitting-up-in-the-tub shots. 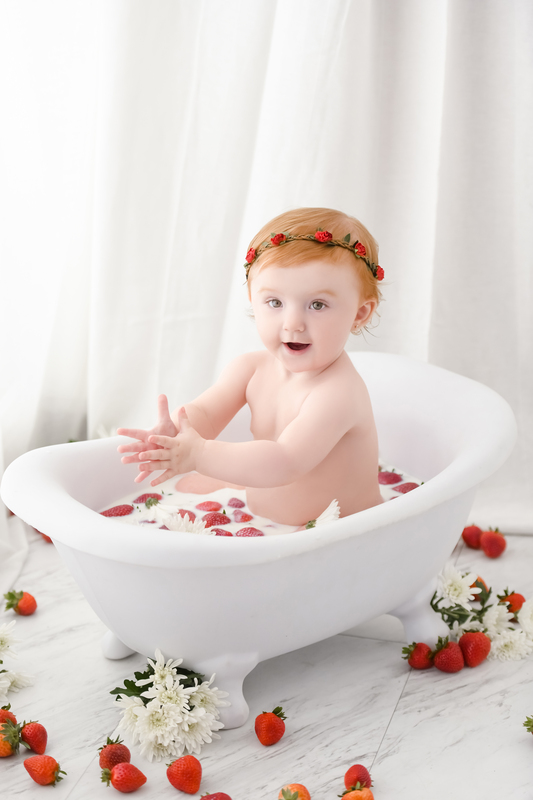 For younger babies between 3-6 months, laying down in the water works best. And for babies even younger, using mom’s arms in the water to hold the baby safely looks really beautiful! 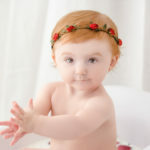 The Pod Photography Los Angeles specializes in custom portrait sessions. 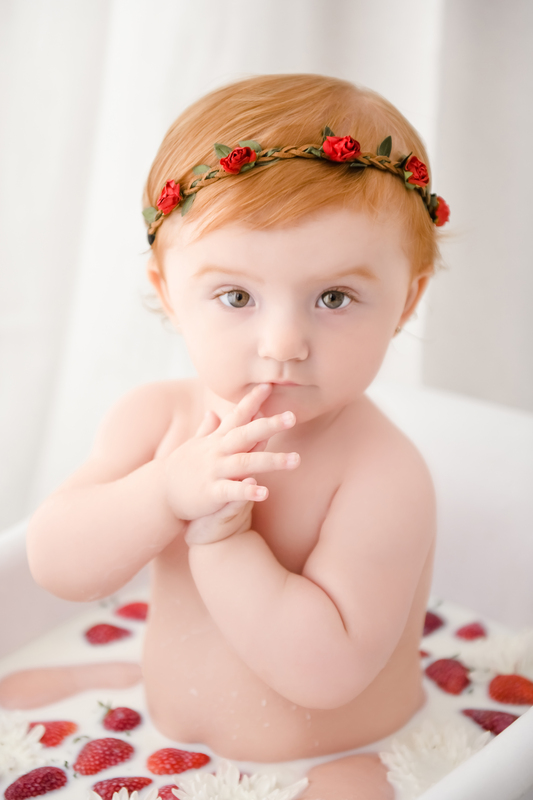 Maternity, newborn, and all of the milestones up to 12 months old is our favorite. Document your baby at 3 months laying on their tummies. At 6 months old, she’ll be grabbing her toes and showing off her personality. At 9 months, they are great sitters! And of course, the first birthday milestone is such a celebration!